New Delhi; and the International Academy of Ayurveda, Pune cordially invite you to the International Ayurveda Congress on Traditional Herbal Remedies from India and Europe to be held on 1 and 2 September 2018 at Leiden, The Netherlands. During the congress, the scientific approach of Ayurveda as a prevention-oriented healthcare system will also be presented. This conference takes its inspiration from an epic 17th century Dutch treatise on medicinal plants of the Western Ghats of South India called Hortus Malabaricus. The inspiration is to connect India, The Netherlands, and Europe through their rich botanical heritage and, at the same time, present the therapeutic potential of plants and the natural approaches to health available in Ayurveda and in traditional remedies from Europe. The conference venue is one of the main conference centers in Leiden, the Holiday Inn, a four-star hotel equipped with dignified halls, pleasant dining facilities, and spacious exhibition areas. 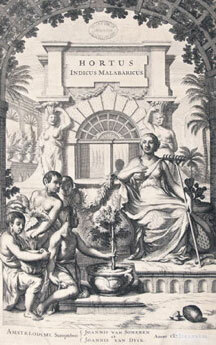 published, originally in Latin, in Amsterdam, between 1678 and 1693 in 12 volumes. plate engravings and detailed descriptions of 742 plants. This work was conceived by Hendrik van Rheede, Governor of Dutch Malabar, in collaboration with a team of nearly a hundred experts including Ranga Bhat, Vinayaka Pandit, Appu Bhat, and Itti Achuden. Scholars in Ayurveda, experts in herbal medicine, research scientists, and physicians with expertise in modern and Ayurvedic medicine will present scientific evidence on preventing disease, promoting longevity, and treating chronic disorders using an integrative approach. The contemporary role of traditional herbal remedies available in India and Europe in the context of current health problems will be presented. Health Fair and Exhibitions including Hortus Malabaricus display. Visit to the famous Hortus Botanicus Leiden, the oldest botanical garden in Western Europe. Visiting the Leiden University Library where the original 12-volume treatise of Hortus Malabaricus and the botanical heritage of the Dutch Golden Age are kept. Ayurveda Education: Establishing highest quality education in Ayurveda for medical practitioners as well as for the public in each country. Ayurveda Practice:: Supporting the practice of Ayurveda in the health service of each country. Ayurveda Research: Promoting scientific research on Ayurveda to showcase preventive and curative benefits in healthcare and encourage its global recognition. Ayurveda Products: Ensuring global availability of authentic Ayurveda products, by overcoming regulatory hurdles, and implementing procedures to guarantee safety and purity. 2. Proposed private meeting (Monday 3 September morning) including Minister of AYUSH, Government of India (to be confirmed), Indian Ambassador to The Netherlands, Dutch health ministry (to be confirmed), decision makers and invited leaders from various countries attending the congress with the purpose of summarizing the achievements and resolutions of the Congress, breakthroughs, areas of concern, and suggestions from leaders from different countries.